syrup for 6-8 months of use. This grade has a very golden color and fine delicate flavor. It is excellent on pancakes and it is delicious on vanilla ice cream, topped with walnuts. Medium amber color, distinct maple flavor. 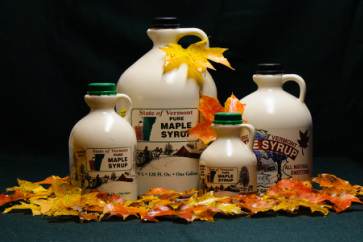 Most popular table grade for pancakes, french toast, etc. Dark amber color, strong maple flavor. Darkest table grade. Excellent choice for cooking, baking beans, making bread, marinades, etc.